For as long as there have been farmers who need to sell what they grow, there have been Farmers Markets. Go to any town or city in America and if you check their history you will find that they all had Farmers Markets in the 17 and 1800s. But today’s Farmers Markets are relatively new phenomena, thanks in part to the growing interest in eating locally produced food. But how did the early Farmers Markets become the modern ones we see today? We know that humans have been involved in agriculture for over 10,000 years. 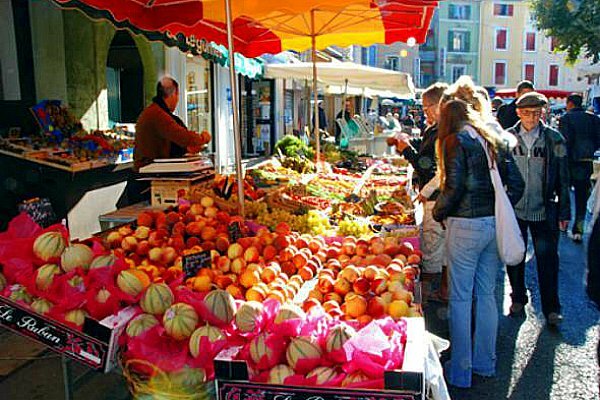 However, it wasn’t until farming techniques improved to the point that farmers produced more than their family could eat that Farmers Markets began to appear in town squares. When the final harvest was in, a huge festival would be thrown, everyone would celebrate and eat, and markets would sell the farmers wares to the town. Because of their importance, farmers markets were the glue of these smaller communities, connecting everyone through the food. Here in America the growth of cities gave Farmers Markets a different flavor. Farms were out of town, and often came to grow one particular crop to sell in the city. But with the introduction of supermarkets and intensive farming including the growth of corporate farming, that was to change. The centralization of farming as a commodity meant new distribution methods and the growth of supermarkets that could carry any kind of food all year round. By the 1950s the use of local Farmers Markets had fallen by the wayside. Most families had grown used to buying their groceries in a store, prepackaged. The local farmer was quickly becoming a relic of the past. Television and other media soon began to reveal the immense damage that intensive farming can do to the land. Books began to appear such as Diet for a Small Planet that extolled the idea of eating simply. The growth of the idea of the 100 Mile Diet, eating only what is produced within a 100 mile radius, began to take hold. From this need to eat healthy organically produced food we saw the resurgence of the Farmers Market. While early Farmers Markets in places like New York City in the 1970s began to take hold, state and federal governments saw them as a foothold to healthy living for the poor. They began to get involved in the development of Farmers Markets as a way to introduce fresh produce into the diets of areas that traditionally saw little local fruits and vegetables. By the early 1990s the country had a little over 2000 Farmers Markets. By 2014 that number had grown to a little over 8000. Today most good sized towns have a weekly Farmers Market and it continues to grow as the demand for locally produced and often organically produced produce grows.